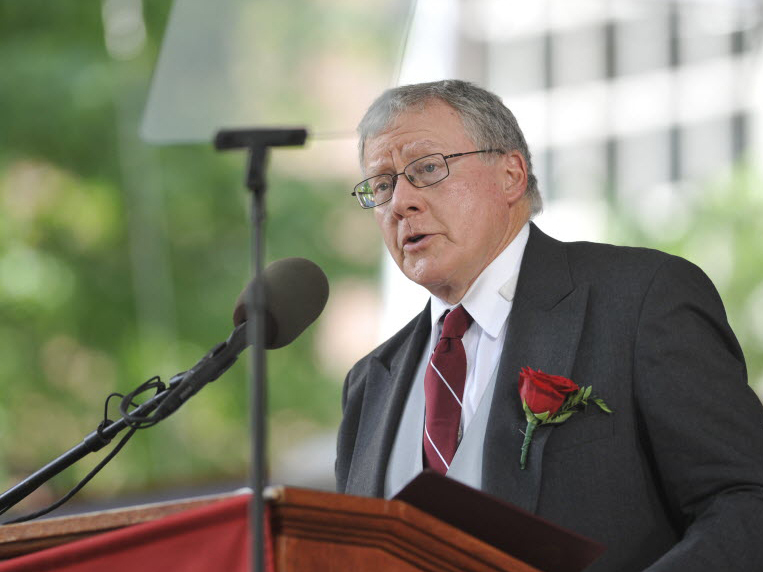 Bloomberg reported on July 21 that James F. Rothenberg ’68, M.B.A. ’70—a member of the Harvard Corporation and past University treasurer, and chair of the board of Harvard Management Company, which oversees the endowment—died of a heart attack at age 69. He was chairman of Capital Group Companies, a leading investment-management firm. He was also a trustee of Caltech. With Rothenberg relinquishing the treasurer’s post last year—and now his untimely death—and the retirement of senior fellow Robert D. Reischauer ’63 and fellow Corporation member Robert E. Rubin ’60, LL.D. ’01, at the same time—a decade of significant change in University governance and in its financial circumstances has drawn to a close. Reischauer was the point person for the changes in the Corporation’s membership, internal organization and management, and self-renewal, announced at the end of 2010—significant reforms of governance in the wake of Harvard’s presidential transitions during that decade and the severe financial challenges toward its end. By dint of his positions, Rothenberg was in many respects the fiduciary focus of Harvard’s financial management throughout that period. As a Corporation member, Rothenberg necessarily, and appropriately, worked principally within the governing boards. Those not privy to Corporation meetings cannot know how it shaped policy or made decisions, but his colleagues were generous in their praise in the University’s announcement of his passing. During his long Corporation service, he recalled in a September 2013 talk, he had already flown 170 round-trip flights from Los Angles to Boston on Harvard business—and that was just to get to town to perform his volunteer duties, warmly remembered by colleagues in public and private remarks. Rothenberg’s interactions with the wider community are best reflected in official statements. In his capacity as treasurer and leader of Harvard Management Company’s board, he was annually quoted in news releases on matters such as the endowment rate of return and the ever-controversial subject of the portfolio managers’ compensation. He was rarely available for additional comment on those matters, and then commented tersely at most. As treasurer, jointly with the vice president for finance, he addressed the community more expansively in Harvard’s annual financial report. Rothenberg had the great fortune to come on duty just as the endowment was beginning its meteoric appreciation. It was valued at $19.3 billion at the end of fiscal year 2003, and shot up to $36.9 billion during the next five years, resulting in what can only be wistfully remembered as Harvard’s salad days. The University spent $2.56 billion on operations in fiscal 2004, and $3.76 billion in fiscal 2009 (even after reining in expenses in the second half of that year): a 45 percent increase. At the same time, huge additions were made to buildings and Harvard’s physical plant, with even more ambitious plans afoot for a vast expansion of the campus in Allston, to be funded with anticipated further endowment gains and philanthropy underpinning significant borrowing. During this exuberant period, as the value of Harvard’s endowment crested, when U.S. Senator Charles Grassley (R-Iowa) criticized universities for failing, in his view, to use their endowment riches to boost financial aid, Rothenberg made the case that supporting Harvard’s mission required and justified doubling its endowment. Fiscal 2010: “…we must continue to be vigilant in managing our finances in order to ensure that Harvard can fulfill its mission even with the continued uncertainty that surrounds us” (described in terms of expected modest endowment investment returns and limits on tuition revenue and sponsored-research funding). Fiscal 2011: “…we recognize that our revenue sources are under pressure and that the economic climate is marked by uncertainty. As a result, we look to fiscal year 2012 and beyond with a continued commitment to prudent expense management, including strategic cost reductions where possible and investments to increase efficiency.” Alongside steps to save money by aggregating purchases, reorganizing the libraries, and consolidating information systems, the letter singled out “disproportionate growth in [employee] benefits costs”—a theme sounded with increasing vigor in following years, and a harbinger of changes in retiree healthcare benefits and, last fall, the introduction of higher faculty and nonunion staff costs for their health insurance. If we do not adapt to overcome the constraints of our circumstances, the future may well find Harvard at a disadvantage, less able to produce for the world the discoveries and graduates that have created such substantial value over time. But if we have the courage to make prudent decisions with our resources and operations, the current moment presents us with the possibility of reshaping that future. Our concerns about financial pressures in higher education and at Harvard are rooted in a deep underlying passion for what universities are and can be. By naming and addressing these pressures rather than ignoring them, Harvard can more quickly adapt to the very different context in which we find ourselves in order to preserve and even enhance our investment in our most important endeavors. And in doing so, we might bequeath to future generations an even more transformative and inspiring institution than the Harvard of today. Pursuing this aspiration has never been more important. Originally published 7/21/2015. Revised and updated 7/23/2015.